Brew rite coffee filters is a key product of the same name company, this highlight how important or big the business of coffee filters is, since its humble beginning in early twentieth century. The coffee filter was invented by Melitta Bentz in 1908. She used paper to filter out the coffee grounds. Not only was the coffee free from the sludge caused by loose coffee grounds, but it also became much more flavorful and less bitter. Since then, coffee filters come in various forms. From paper coffee filters, Gold Tone coffee filters, cloth filters, flat bottom coffee filters, and cone bottom coffee filters, all of these share the same function, which is to filter out the coffee grounds during the brewing process and help enhance the flavor of the coffee. 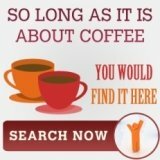 There are numerous companies that manufacture coffee filters, such as Melitta Coffee, Krups Coffee, and Brew Rite, among others. 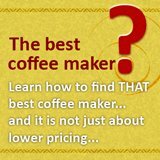 All these specialize in manufacturing different kinds of coffee filters. For instance, Brew Rite is known for its commercial paper filters, whereas Krups Coffee is known for its paper and Gold Tone coffee filters. The Brew Rite Coffee Filters are commercial coffee filters that fit Bunn coffee makers and other wide-based 12 cup coffee makers and grind and brew coffee makers. These Brew Rite Coffee Filters have a 4 ½ inch wide base. What’s special about these paper coffee filters is that they are whitened not from bleach, but from oxygen. 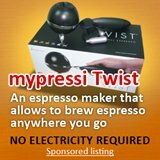 This special whitening process greatly enhances the ability of the coffee filter to aid in the coffee extraction process. In other words, these filters do not react with hot water as it extracts the flavor from the coffee during the brewing process, thus yielding better flavor. 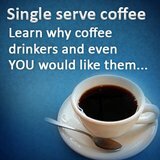 These filters can be used outside of your coffee maker as well. More specifically, the Brew Rite Coffee Filters are also usable for popcorn and nut bowls, lint-free window wipes, ice cream bar drip shields, and for art and craft projects. Keep in mind, though, that these filters are made for commercial use, such as offices and restaurants. Therefore, these are a little bit more expensive than other paper coffee filter brands. Nevertheless, the Brew Rite Filters do what they’re supposed to, which is to prevent coffee grounds from going into the coffee pot while not compromising the flavor of the coffee. 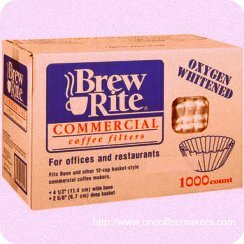 Ultimately, if the Brew Rite Filters are compatible with your coffee maker, try it out. Brew Rite Filters usually come in a bundle of 1000 paper coffee filters. If you’re unsatisfied by the paper filters that you’re currently using because it leaves a papery taste or cardboard like taste to your coffee, give the Brew Rite Coffee Filters a whirl.